This is the personal website of Dries Buytaert. Dries is the project lead of Drupal, co-founder and chief technology officer of Acquia, and co-founder of Mollom. On his blog, he writes about the web, open source, Drupal and photography. This week's Grammy Awards is one of the best examples of the high traffic events websites that Acquia is so well known for. This marks the fourth time we hosted the Grammys' website. We saw close to 5 million unique visitors requesting nearly 20 million pages on the day of the awards and the day after. From television's Emmys to Superbowl advertisers' sites, Acquia has earned its reputation for keeping their Drupal sites humming during the most crushing peaks of traffic. As many of my loyal blog readers know, I sit down to write a retrospective at the end of each year. It's helpful from the perspective of seeing how far Acquia has come in a single year, but it should also give you a glimpse of what is in store for Acquia in 2016 and beyond. File this under "better late than never". Before the year closes out, I wanted to post my 2015 DrupalCon Barcelona keynote video and slides. I archive all my DrupalCon keynotes on my site so anyone who is interested in taking a trip to memory lane or studying the evolution of Drupal, can check out all my previous DrupalCon keynotes. Read more about Should we decouple Drupal with a client-side framework? Algorithms rule our lives, so who should rule them? Volkswagen's recent emissions scandal highlighted the power that algorithms wield over our everyday lives. As technology advances and more everyday objects are driven almost entirely by software, it's become clear that we need a better way to catch cheating software and keep people safe. Read more about Algorithms rule our lives, so who should rule them? One thing that is exciting to me, is how much we appear to have gotten right in Drupal 8. The other day, for example, I stumbled upon a recent article from the LinkedIn Engineering team describing how they completely changed how their homepage is built. Building Drupal 8 with all of you has been a wild ride. I thought it would be fun to take a little end-of-week look back at some of our community's biggest milestones through Twitter. If you can think of others important Tweets, please share them in the comments, and I'll update the post. 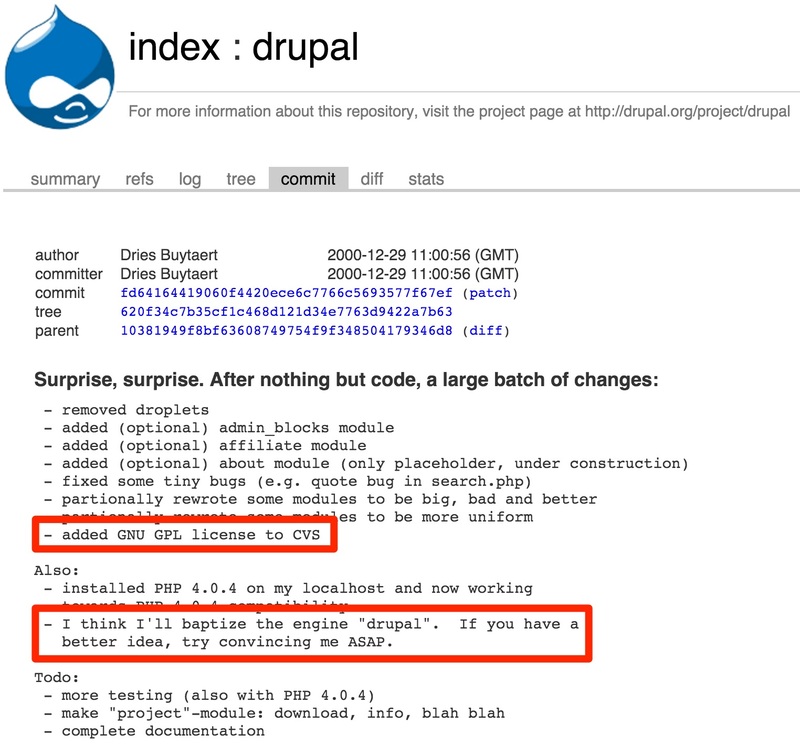 We just released Drupal 8.0.0! Today really marks the beginning of a new era for Drupal. Over the course of almost five years, we've brought the work of more than 3,000 contributors together to make something that is more flexible, more innovative, more easier to use, and more scalable. A couple of weeks ago a Chief Digital Officer (CDO) of one of the largest mobile telecommunications companies in the world asked me how a large organization such as hers should think about organizing itself to maintain control over costs and risks while still giving their global organization the freedom to innovate. The Industrial Revolution, started in the middle of the 18th century, transformed the world. It marks the start of a major turning point in history that would influence almost every aspect of daily life. The Industrial Revolution meant the shift from handmade to machine-made products and increased productivity and capacity. Technological change also enabled the growth of capitalism. Factory owners and others who controlled the means of production rapidly became very rich and working conditions in the factories were often less than satisfactory. At Acquia Engage, our annual customer and partner conference held last week, Cisco's Jamal Haider spoke about the tremendous savings ($400 million USD!) that came from building its support community on the Acquia Platform and Drupal. The company transformed its support organization into a valuable self-service portal for customers, leading to a 77% deflection rate for customer service calls.